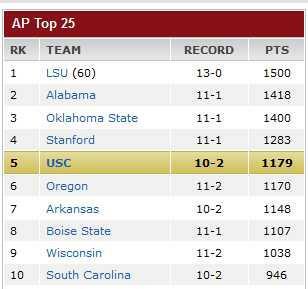 The Trojans are currently ranked 5th in the AP Top 25. Stanford is ranked 4th and Oregon is ranked 6th. It is not a BCS bowl game but it is nice for the football team to get some recognition. I wonder if the Pac12 could have sent all three to BCS games. I wonder if the Pac12 could have sent all three — Stanford, USC, and Oregon — to BCS games. How convenient USC’s bowl ban is for the likes of Virginia Tech and Michigan!